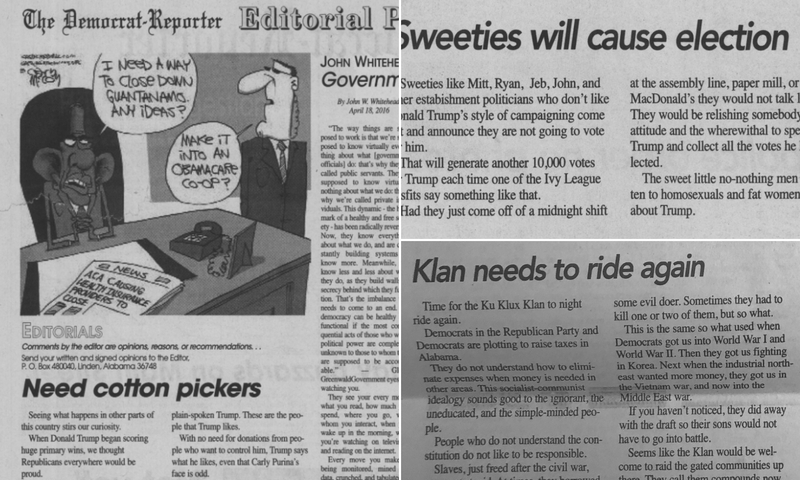 Several prominent Alabama leaders denounced a recent editorial written by Goodloe Sutton, editor of The Democrat-Reporter, urging the Ku Klux Klan to ride again and lynch members of Congress. Linden is in Marengo County and is part of the Seventh Congressional District represented by Congresswoman Terri Sewell, a Democrat from Selma. Sewell is the first African-American woman to represent Alabama in the Congress. The state of Alabama is still haunted nationally and internationally by historical images from decades of Jim Crow segregation and violent attacks by the KKK and state and local government on civil rights activists. Many civil rights leaders, including Fred Shuttlesworth, had their homes bombed by white supremacists. Four little girls were killed when the Sixteenth Street Baptist Church in Birmingham was bombed by Klansmen. The Alabama Press Association voted to censure Sutton and has suspended the membership of The Democrat-Reporter. “I think it needs to be looked into by the FBI because, in my opinion, he’s making threats to legislators and telling them that the Klan essentially needs to take care of the Democrats,” Alabama NAACP President Benard Simelton told the Alabama Media Group.